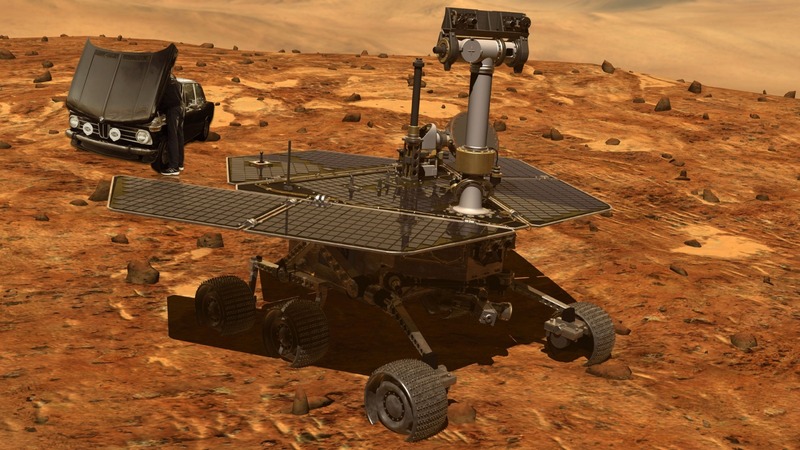 NASA's Opportunity rover began its 16th year on the surface of Mars one week ago today. The rover landed in a region of the Red Planet called Meridiani Planum on Jan. 24, 2004, sending its first signal back to Earth from the surface at 9:05 p.m. PST (Jan. 25, 2004, at 12:05 a.m. EST). The golf-cart-sized rover was designed to travel 1,100 yards (1,006 meters) and operate on the Red Planet for 90 Martian days (sols). It has traveled over 28 miles (45 kilometers) and logged its 5,000th Martian day (or sol) back in February of 2018. "Fifteen years on the surface of Mars is testament not only to a magnificent machine of exploration but the dedicated and talented team behind it that has allowed us to expand our discovery space of the Red Planet," said John Callas, project manager for Opportunity at NASA's Jet Propulsion Laboratory in Pasadena, California. Here Opportunity is providing roadside assistance for this stranded 2002er. Normally reliable, and having passed stringent regulations to roam the Martian surface, this one’s suffered some problems with it’s Martian-atmosphere-tuned blow-thru Weber 55s after only a short few days. Sadly, the rover doesn’t fully comprehend why all vehicles aren’t as reliable and long-lasting as it is, so it can get a bit cantankerous on road calls..